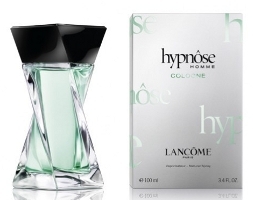 Lancôme will launch Hypnôse Homme Cologne this month. The new limited edition fragrance for men is a lighter, fresher, more citrus-y version of 2007's Hypnôse Homme. It was inspired by traditional Eaux de Cologne, and follows last year's Hypnôse Homme Fresh. The fragrance notes include lavender, orange, bergamot, lemon, coriander, petitgrain, sandalwood and cedar. Light, fresh, citrusy…come on!…how many light fresh scents do we need? ?…pretty soon companies will be bottling water calling it a clean aquatic…why bother???? Looks like Lancome will do this one every year so long as it sells…have to say that the color makes it look like mouthwash to me! SO true. It did remind me of mouthwash. I've also noticed the change in packaging lately, esp the text & graphics. It seems Lancome is trying to cast a wider net. (read, “younger crowd”). Didn't notice that w/ the outer packaging at all — it does look young, will have to see if I can find a picture of the original box. Seeing this brought Hypnose for women to mind, which I had forgotten about. I really like that fragrance – I don't think it was a big hit with perfumistas tho. [I'm merely a perfume enthusiast hehe] I definitely will purchase it again. Plus, I like the look of the bottle to boot. I really loved the original Hypnôse Homme for awhile, but have been off it lately. I sniffed the first flanker briefly and honestly couldn't tell the difference. The original is fairly “dense” amber/lavender, so a light one with more citrus might definitely be welcome (and is what I had hoped the “Fresh” would be). So, to answer the first commenter, I think — despite the ad copy — this might be not so much of citrus/airy/watery thing, but a matter of lightening up a very heavy (and in my opinion, original in terms of recent mainstream men's product) scent. I'd often thought of “leavening” the original by layering it with something very limey or lemony. I also don't mind the color. Fath's Green Water not only looks like mouthwash, it somewhat smells like it too! It's true, or is for me — I was not a big Hypnose fan. I liked Magnifique though (although don't think many other perfumistas did). Ah. I did not smell the Fresh, and was wondering if this was really the same thing tweaked slightly & given a new name. Hope it will be the lemon you're hoping for! Just adding that I also really liked Magnifique — enough to buy a pack of spray samples. I know you liked Sensuous a lot, R., but for me, Magnifique was everything Sensuous was not in that “spicy modern woods” category. That and the EL Amber Ylang were huge surprise hits for me late last year. Oh, and just realizing, I seem to be a fan of EL in general. They have quite a few fragrances that I'm wild about. [Sensuous, Bronze Goddess, The PC ones, Intuition [which I think perfumistas in general turn their noses up at] and I even crave Youth Dew sometimes.] Of course, none of this has anyting to do with Hynose Homme Cologne – sorry. lol Btw – I don't think I've ever mentioned how delightful I think NST is and much I enjoy it here. Oh good. What the world really needs, another “fresh citrusy” fragrance for men. Aren't there enough in the world already? If you want a great fresh cologne, get Acqua di Parma Colonia Assoluta and be done with it. Youth Dew is nothing to sneeze at, it's considered one of the all time great orientals, and dries down to a beautiful amber resin (after about 8 hours…..). It is a bit of a nose-blaster though. 'Nose blaster' hehe It certainly is, but it sure does end up being something special and comforting. Nice to know it's considered an all time great – as opposed to being a fuddy duddy scent. And I mentioned BG, which I recently purchased – such a scrumptious fragrance, but could the packaging BE any tackier? [spoken like Chandler from 'Friends'] I'm keeping that bottle hidden in a cabinet. Well, I can see the need for say, 10 or 20 of them, not least because I don't like Assoluta. But it's quite true that we don't need over 100 of them a year, which is about what we seem to be getting! Either that or pinching more cents–I cannot tell with Lancome anymore.